In Maputo, absence is felt in the infrastructure. I spend several months away from the city, and the skyline has changed. Banks and technology companies replace old lots that belonged to a friend of a friend’s grandmother’s best friend. Old traditional Portuguese bakeries, or pastelarias, are now serving single espressos alongside Chinese food restaurants and small household-run delis which cater to the expat community. In many ways, Maputo is not unlike similar cities in sub-Saharan Africa, such as Nairobi or Dar es Salaam. Foreign investment has made it a complicated ecosystem of growth and continued inequity. This plays out on streets housing multimillion dollar apartments that look down over roads which are repaired by hand – little to no machinery is available. I find this gossip in conversations with both research participants as well as family members, and with members of every class and ethnic group. It is really a discussion about space, and who gets to occupy (or reoccupy?) these sidewalks, no matter how crumbled they become. 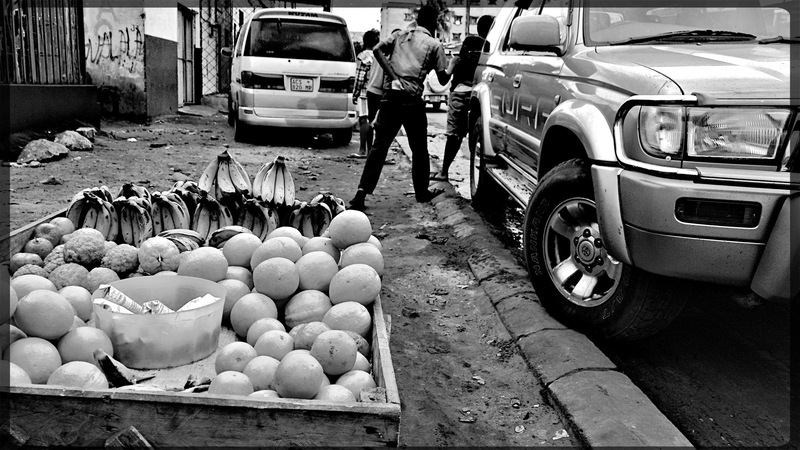 On many an occasion, I myself have both simultaneously sidestepped or slipped on garbage from the street vendors outside my family’s home in a middle-class neighbourhood in Maputo, and found relief in being able to purchase several bananas and papayas outside my front gate after a long run. The market stalls didn’t come out of nowhere, but sometimes it felt that way. I prefer not to drive in Maputo, so I was able to see first-hand on my daily walks just how many informal sellers had made their way into the city center over the course of a matter of months. The period from 2014-2016 saw the political and economic landscape shift. As the context tilted, the informal sellers also moved around, occupying spaces they hadn’t before. Since I began my life and work in Maputo, the country has gone through some high times and some incredibly low ones. Mozambicans refer to the low ones as ‘a crise’ or, ‘the crisis.’ Private loans taken by the Mozambican government which went undisclosed to the International Monetary Fund sent the local currency, the metical, into freefall in relation to the US dollar. Inflation, banking restrictions on spending money abroad, and an overall tightening of expenditure alongside insecure and wary investors took Mozambique from the ‘donor darling’ model to something else. I couldn’t help but think to myself that all of it had some connection. 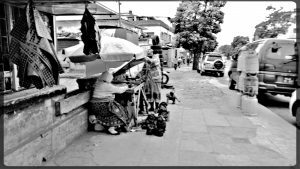 While some upper-class Maputo residents felt unsettled by the increased sellers on the street, others were having a different type of discussion. That conversation was about allowing people to make money, to create a livelihood, in an economic environment where it seemed almost impossible. As accounts lost thousands and even millions in value in a matter of months, it seemed a foolish decision to waste political and economic anger on trying to regulate the most vulnerable. Because the street sellers were visible in neighbourhoods where they hadn’t ventured previously, new interactions were taking place between the upper and middle classes and the poorest Maputo residents with regularity. This, I found, even changed the narrative of ‘a crise’ and how people related to it. Instead of becoming a flash point for conflict against the elites, who many believe put the country on the path to this economic hardship, classes were interacting on the street in ways they hadn’t before. Complaints about ‘the system’ replaced the dialogue around blame which had been circulating since news of the loans had come to light. Small interactions in everyday life fostered a type of communication that many people I spoke to described as new, or at the very least, new again. For both groups, interest in maintaining a conflict-free urban environment was a shared reality. Elites preferred to deflect personal liability for political decisions and prevent large-scale resistance from the general population. Mozambicans at the bottom of the economic ladder wanted freedom from regulation when attempting to earn a livelihood in the informal economy. While I don’t believe street stalls across the city street is a panacea for erasing class divisions in economic uncertainty, I think it says something about Maputo. A city ever-changing just like all cities, Maputo gave rise if even for a short time to a dismantling of the myth of the dysfunctional African city center. Dynamism, responsiveness, and informal communication became a way for people to understand a particular place in space and time.